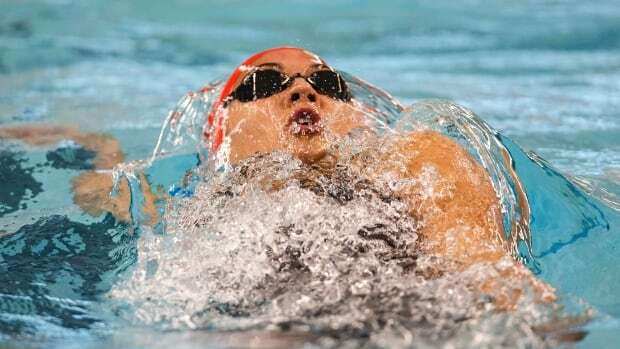 The world 100-metre backstroke record will have to wait for Kylie Masse. The 23-year-old native of LaSalle, Ont., won the event Wednesday night at the Canadian swim trials in 58.16 seconds. While that secured Masse a spot on the national team for the '19 world championships, it was short of American Kathleen Baker's world mark of 58 seconds. Masse held the world record of 58.10 seconds that she set at the '17 world championships in Budapest. But Baker broke that mark last summer. "I don't think there's a set day that you think, 'Today I'm going to do it. Another day I'm not going to do it,"' she said. "You always want to feel you can do it whatever. "I think it's always something that's in the back of my mind and striving for all the time. I can't control how fast other people go, I just have to stay in my lane and do what I can do." Ruck, who won eight medals at the '18 Commonwealth Games in Gold Coast, Australia, was more than content with her finish. It secured the double bronze medallist at the '16 Rio Summer Games a spot on the Canadian team that will compete at the world championships this summer in Gwangju, Korea. "I've never been to Korea," she said. "I hear they have really good (bubble tea) there." But Ruck was aware she'd have to be quick in the final swimming against Masse. "I always try to stay in my own race whoever it's against," she said. "But, yeah, definitely swimming against Kylie it was like I could kind of see her." Masse said her two races Wednesday are an indication she's heading into the world championships in the right direction. She won the preliminary event in 58.19 seconds, which was the fastest time in the world at that distance prior to Masse's performance in the final at the Toronto Pan Am Sports Centre. "I think my two swims today definitely give me a lot of confidence and reassurance," she said. "I don't think it's been as easy training lately so it's definitely nice to do that time." Earlier on Wednesday, Saskatoon's Shelby Newkirk set a world record in the women's 100-metre backstroke S7 event with a time of one minute 19.99 seconds. She won the final later that night in 1:20.49. Nicolas-Guy Turbide of Quebec City won the men's event in 59.93 seconds. Tyson Macdonald of Tillsonburg, Ont., was second in 1:04.86 while Nick Bennett of Qualicum Beach, B.C., took third in 1:06.14. Sydney Pickrem, a dual U.S./Canadian citizen, claimed women's 200-metre breaststroke after race winner Kierra Smith of Vancouver was disqualified. Pickrem had a time of 2:22.63 while Winnipeg's Kelsey Wog claimed second in 2:22.82. Mary-Sophie Harvey of Trois-Rivieres, Que., was third in 2:27.41. "Yes, very much," she said. "Instead of crossing my fingers whenever I mention worlds I can actually talk about it because now I'm going." Ditto for Vancouver's Markus Thormeyer, who punched his ticket by winning the men's 100-metre backstroke in a Canadian-record time in 53.35 seconds. Calgary's Cole Pratt was second in 54.64 while Robert Hill of North Vancouver, B.C., took third in 55.32. "When you get it out of the way on the first day, it's a bit of a relief," Thormeyer said. Vancouver's James Dergousoff captured the men's 200-metre breaststroke in 2:12.33. Ottawa's Eli Wall was second in 2:12.80 while Jaren LeFranc of Penticton, B.C., took third in 2:14.90. Maggie MacNeil of London, Ont., won the women's 50-metre butterfly in 26.15 seconds, ahead of Haley Black of Prince George, B.C., (26.43). Sadie Fazekas of Essex, Ont., was third in 26.91. Will Pisani, another dual American-Canadian citizen, claimed the men's race in 23.57 seconds, finishing ahead of Montreal's Mehdi Ayoubi (24.24). Ottawa's Alexandre Perreault was third in 24.34.